There are plenty of Saturdays when I simply don’t have time to go to market. There’s no Waitrose nearby either…Walworth is just not Waitrose country! Market Porter (now rebranded as ‘Heartier’) could be made for someone like me. They have a great selection of boxes where you can buy set lists of meats, cheeses and even chocolate. And, they also let you mix and match your own boxes. I was offered the chance to do the latter and picked a mix of cheese, chocolate, charcuterie and meat that would keep me happy for a while. I was somewhat intrigued. Would the content of my box actually be as good as it looked on paper? 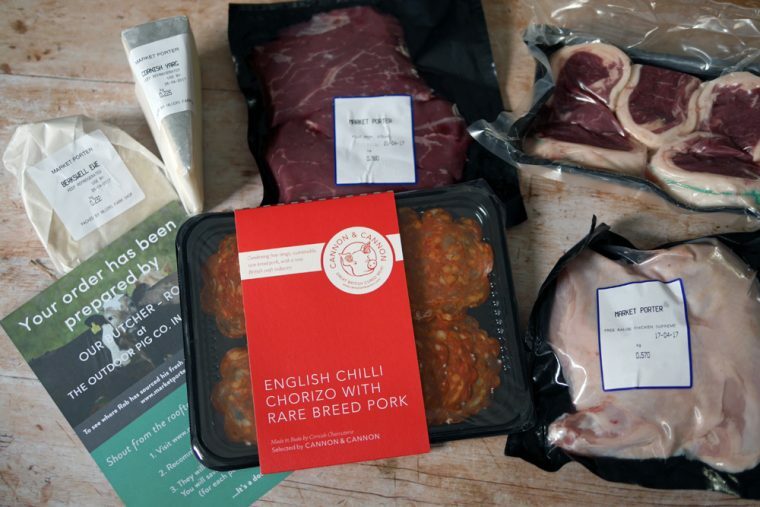 My order – 2 chicken supremes, 2 flat iron steaks, lamb noisettes, Berkswell and Cornish Yarg, Cornish charcuterie’s chilli chorizo and Chocolarder’s caramelised nibbed cacao came to a total of £53.45. The most expensive item on the list, the lamb noisettes, were £11 but there was enough for the three of us. The Flatiron steaks were £5 each but were both a good size. If I’d been feeding a family I’d have used them to make a stirfry and there would have been easily enough for 4 or 5 people. Pricing was very similar to what I’d expect to pay in Waitrose – more expensive than my local Morrisons but with a far wider choice of products. We ate the flat iron steaks simply grilled with a melange of peppers and onions and a little mustard. 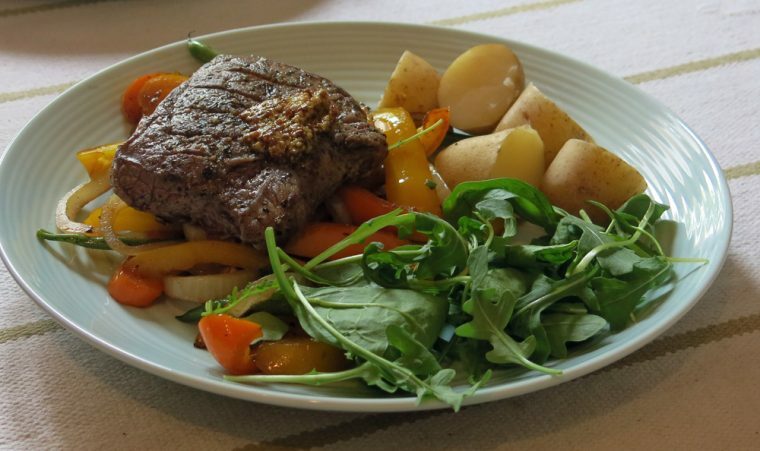 The meat was excellent quality and the steaks beautifully flavoured. 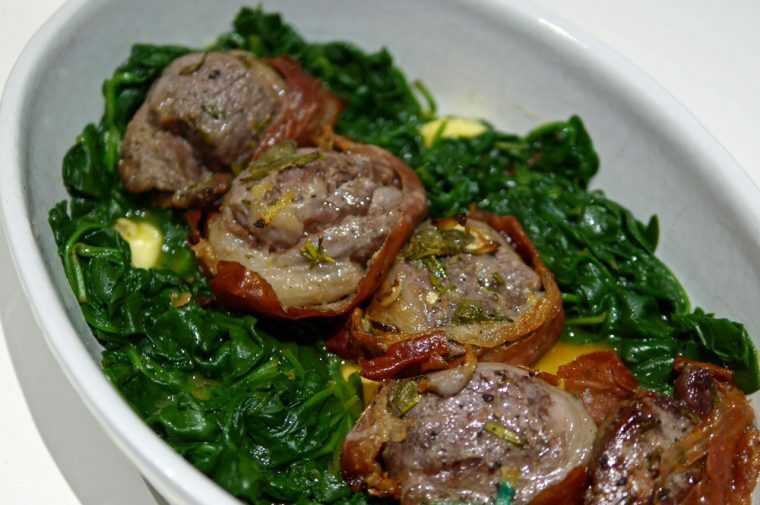 The lamb noisettes were cooked using a recipe I wanted to try from Delicious magazine – ‘Italian Lamb Noisettes’. It’s one I’ll definitely use again. The saltiness of the ham and the citrus tang from the lemon zest made a beautiful contrast to the sweet, tender lamb. Next time though, I’ll try to remember to start the marinade early. Due to an oversight on my part, my guests had to wait 20 minutes before I could start to cook. We also ate and enjoyed the two cheeses with the same meal. Everyone remarked on how perfectly matured they were. Yarg can be overly dry and crumbly – but this was perfectly firm, yet creamy. 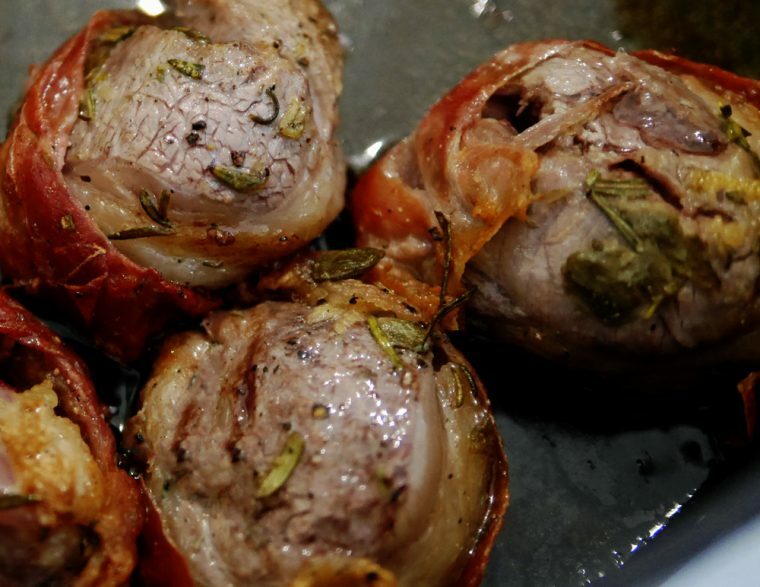 The Berkswell had a wonderful depth of flavour and was perfect to nibble on with a few grapes. We rounded the meal off with coffee and nibbles of the delicious Chocolarder chocolate which I will definitely be buying again. MarketPorter/Heartier have a whole range of artisan chocolates on offer including Marou some wonderful sounding Amelia Rope lemon and sea salt chocolate and of course, the Chocolarder which we enjoyed. 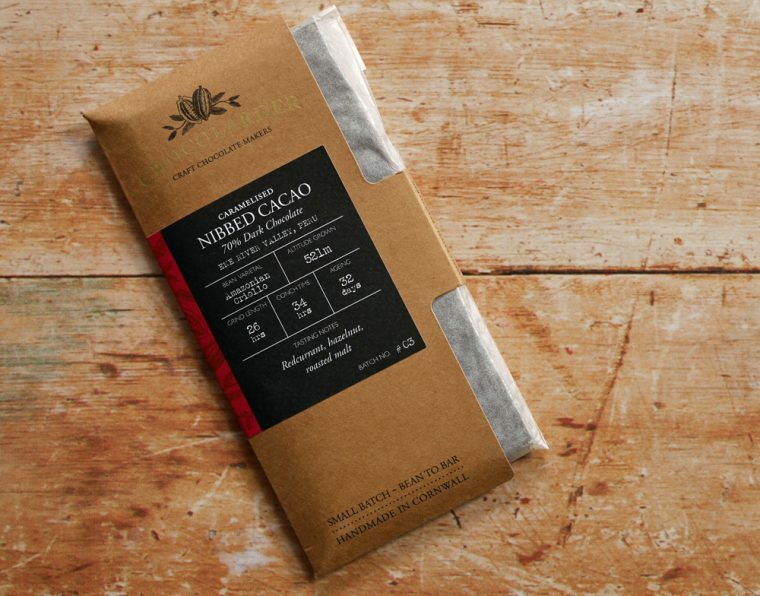 These are posh artisan bars at the kind of prices you’d pay at Waitrose. Chicken supremes are a cut you seldom find in a supermarket and yet I love cooking with them. 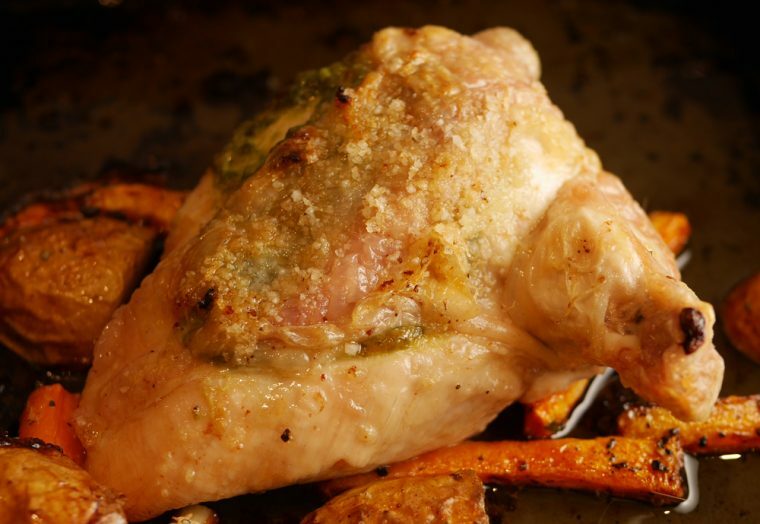 A boneless breast, with the skin on and with a half wing, makes this cut great to oven-cook without drying out too much. 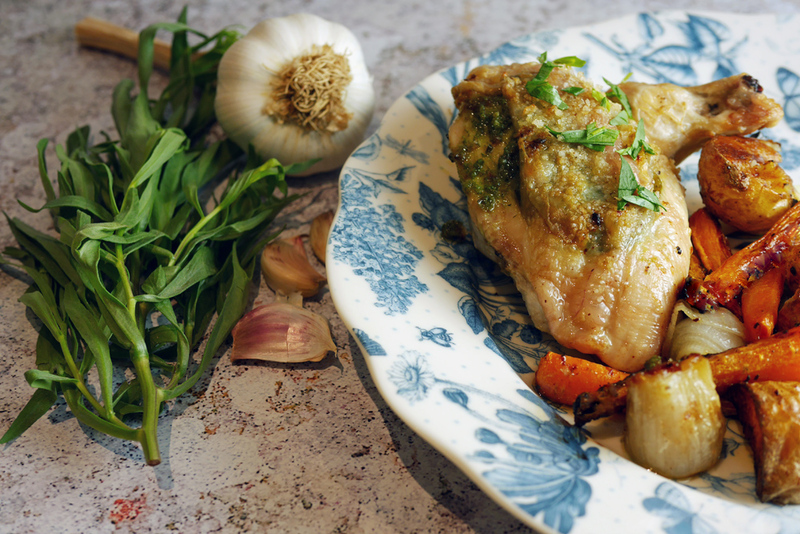 I wanted to make a simple dish which would showcase the chicken and so rather than my normal tarragon chicken recipe, which involves a tarragon cream sauce, I made a garlic and tarragon butter to stuff under the skin. Carefully cut a slit in the skin of the chicken and loosen the skin, making sure that you don't open the edge of the 'pocket' up. Scrape the carrots and cut into batons. Cut the fennel into slices, removing the central core. Half or quarter the potatoes. Peel the shallots and half them if they are large. Mix all the vegetables with the olive oil, lemon juice and zest and season well with salt and pepper. Season the skin of the chicken with salt and pepper. Roast for 30 -35 minutes until the chicken skin is crispy. Baste occasionally with the oil. Serve garnished with a little fresh tarragon. 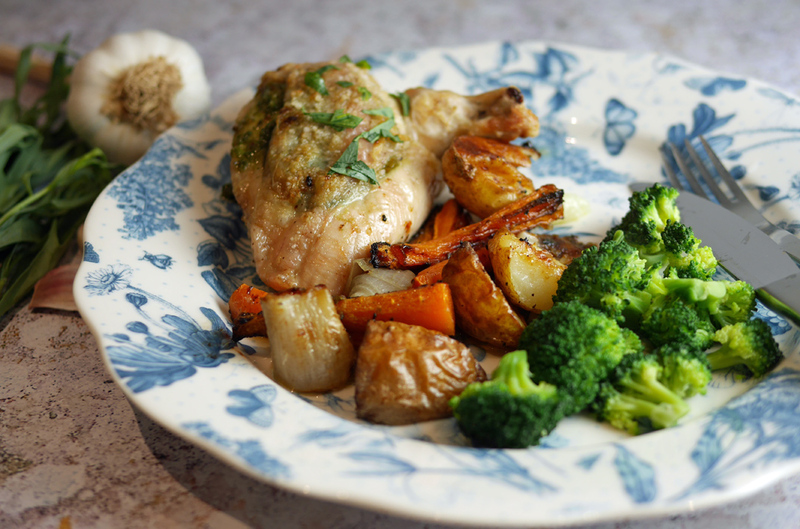 The chicken was cooked in the oven on a bed of roasted vegetables, dressed in lemon and olive oil. No other herbs, just a good sprinkling of salt and pepper. A simple, one pan supper that would be posh enough to serve up for a dinner party. 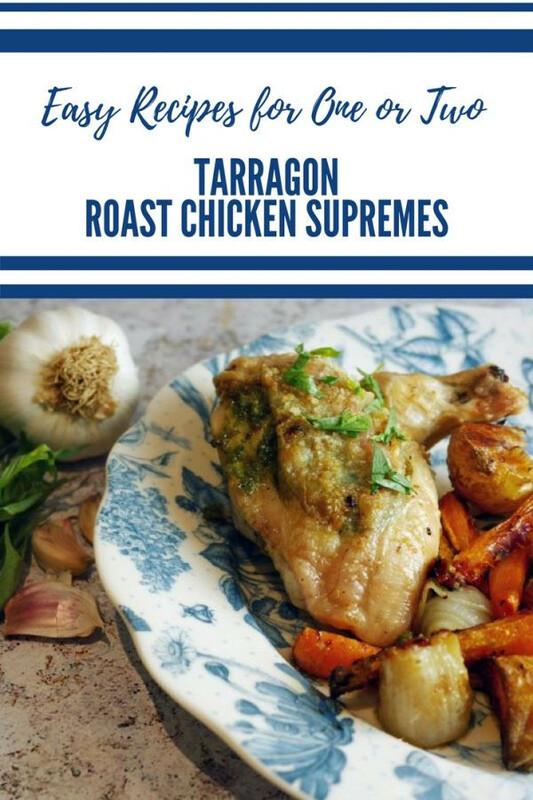 I’ve included the recipe for tarragon chicken supremes for those who would like to try at home. It really is delicious and I’ll be looking for chicken supremes again. If you can’t find the supremes, you could make the same dish with poussin too. And, I think the dish looks stunning on my new favourite Portmeirion Botanic Blue design china. Market Porter really impressed me (and I am sure Heartier will continue to work in exactly the same way). My box arrived on the day it was supposed to and was so beautifully packed that had I not been at home, it could have been safely left for a few hours. A carefully sealed cardboard box containing the meats and cheeses was lined with silver foil insulation and packed with ice packs and every item was carefully wrapped; waxed paper for the cheeses and vacuum sealed packs for the meats and charcuterie. I even got a leaflet telling me where my meat had come from – my butcher was Rob at the Outdoor Pig Company in Alcester. The chocolate came in the post, carefully packaged in a letterbox friendly box. And, there was absolutely no waste. I’d order from Heartier again. The combination of really top quality meat with products that have a longer shelf life like charcuterie and cheese means that I wouldn’t have a problem spending £50 to qualify for free delivery. 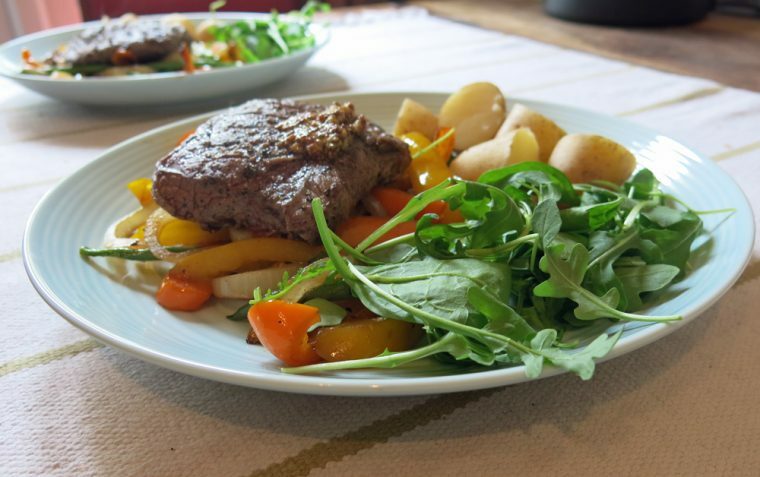 When the food arrived there was a good ‘use-by’ period on everything – one of my biggest complaints about online supermarket shopping is that sometimes you order a week of food to find that several items need to be used in the next couple of days. If I was feeding a family then I’d definitely consider one of the boxes, which are heavily discounted. But, for a small household, the option to mix and match is exactly what I am looking for. 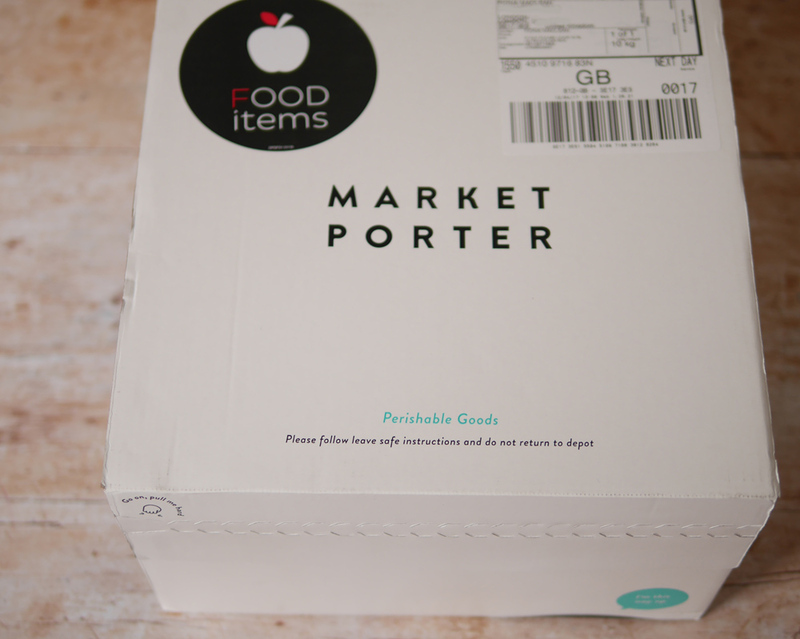 Disclosure: I was sent a free trial box of Market Porter produce but was not obliged to write a favourable review. Oh yummy this looks and sounds so delicious! My mouth is watering! !